Last time, we looked at how including intervertebral cartilage changes the neutral pose of a neck — or, more specifically, of the sequence of cervical vertebrae. The key finding (which is inexplicably missing from the actual paper, Taylor and Wedel 2013c) is that adding cartilage of thickness x between vertebrae whose zygapophyses are height y above the mid-height of the centra elevates the joint’s neutral posture by x/y radians. Figure 14. Geometry of opisthocoelous intervertebral joints. Hypothetical models of the geometry of an opisthocoelous intervertebral joint compared with the actual morphology of the C5/C6 joint in Sauroposeidon OMNH 53062. A. Model in which the condyle and cotyle are concentric and the radial thickness of the intervertebral cartilage is constant. B. Model in which the condyle and cotyle have the same geometry, but the condyle is displaced posteriorly so the anteroposterior thickness of the intervertebral cartilage is constant. C. the C5/C6 joint in Sauroposeidon in right lateral view, traced from the x-ray scout image (see Figure 12); dorsal is to the left. Except for one area in the ventral half of the cotyle, the anteroposterior separation between the C5 cotyle and C6 condyle is remarkably uniform. All of the arrows in part C are 52 mm long. But how thick was the intervertebral cartilage in sauropods? Determining the ONP of a sauropod’s cervical vertebral column given only its bones requires is necessarily speculative since the cartilage, and thus the intervertebral spacing, is unknown. Part of the our goal in our own PLOS collection paper (Taylor and Wedel 2013c) was to take some very tentative first steps towards estimating the cartilage thickness. To do this, we used two approaches. First, we looked at CT scans of articulated vertebrae; and second, we measured the cartilage thickness in a selection of extant animals and thought about what we could extrapolate. Since the CT scans were Matt’s domain, I’m going to pass over those for now, in the hope that he’ll blog about that part of the paper. Here, I want to look at the extant-animal survey. Figure 18. Cartilage in the neck of a rhea. Joint between cervicals 11 (left) and 10 (right) of a rhea, sagittally bisected. Left half of neck in medial view. 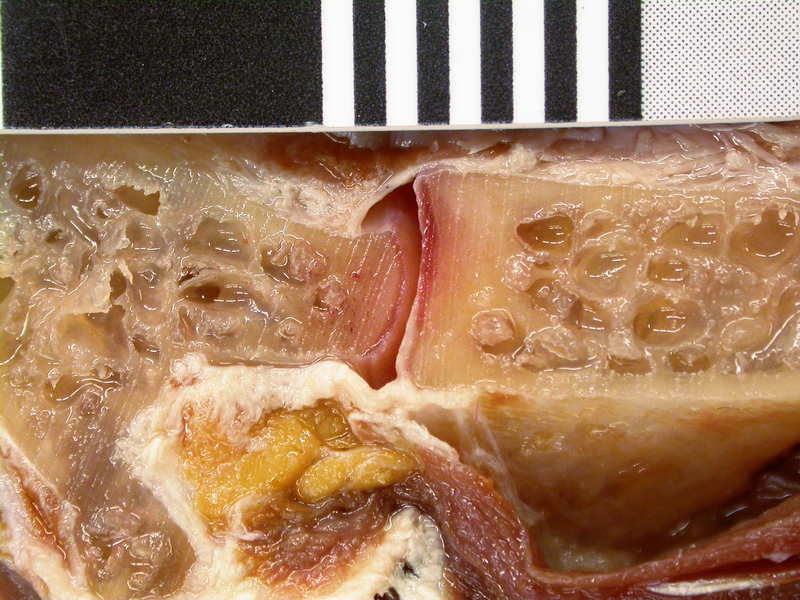 The thin layers of cartilage lining the C11 condyle and C10 cotyle are clearly visible. their cartilage thickness was measured by a variety of methods. Our goal was not at all to reach anything like a definitive answer, but just to get the question properly asked, and so hopefully to catalyse much a more detailed survey. With that proviso out of the way, here are our main results (from Table 4 of the paper, though here I have removed the sauropod CT-scan rows since we’ll be writing about those separately). Turkey 4.56% This study Difference in measurements of intact neck and articulated sequence of cleaned, degreased and dried vertebrae. Ostrich 6.30% Cobley et al. (2013) Difference in measurements of individual vertebrae with and without cartilage. Rhea 2.59% This study Measurement of in situ cartilage in bisected neck. Alligator 14.90% This study Measurement of in situ cartilage from photograph of cross section. Horse 6.90% This study Measurement of in situ cartilage from photograph of cross section. Camel 13.00% This study Crude measurement from condyle margin to cotyle lip of lateral-view X-ray. This is an interim measurement, which we hope to improve on when we obtain better images. Dog 17.00% This study Measurement of intervertebral gaps in lateral-view X-ray, uncorrected for likely concavity of cotyles. Giraffe 24.00% This study Difference in measurement of intact neck and closely articulated sequence of cleaned vertebrae. Young juvenile specimen. Muraenosaurus 14.00% Evans (1993) Measurement of in situ cartilage in fossils. Cryptoclidus 20.00% Evans (1993) Measurement of in situ cartilage in fossils. We’ve expressed the measurements as a ratio between cartilage thickness and the length of the bone itself — that is, cartilage/bone. Another way to think of this is that the percentage is a correction factor which you need to add onto bone length to get whole-segment length. Note that this is not the same ratio as the proportion of total segment length that consists of cartilage: that would be (cartilage thickness + bone length) / bone length. Even this small survey throws up some interesting points. First, there is a huge range of proportional cartilage thicknesses: almost an order of magnitude from the 2.59% of the Rhea up to the 24% of the juvenile giraffe — or, even if you discard that because of its ontogenetic stage, up to 17% for the dog. And note that the 17% for the dog is probably an under-estimate, since we were working from an X-ray that doesn’t show the concavity of the vertebral cotyles. Figure 22. Dog neck in X-ray. 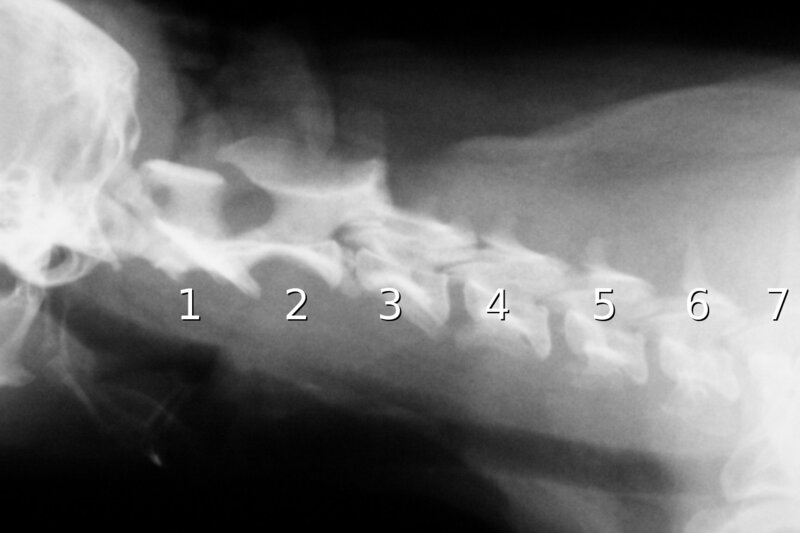 Neck of a dog (dachsund), in X-ray, with the seven cervical vertebrae indicated. This photo has been used with permission from the Cuyahoga Falls Veterinary Clinic. The second thing to note is that the cartilage measurements for birds (average 4.5%) are are much lower than those of crocodilians (14.9%) or mammals (15.2%). What does this mean? Among these groups, sauropods are most closely related to birds; but birds and crocs form the extant phylogenetic bracket, so we can’t tell from phylogeny alone whether to expect them to more closely approach the avian or crocodilian condition. Furthermore, in being opisthocoelous (condyle in front, cotyle at the back) sauropod cervicals most closely resemble those of mammals in gross structure — and they have the thickest cartilage of all. The third thing to note is that there is considerable variation within groups. Although the cartilage is proportionally thin for all three birds, it’s more than twice as thick in the ostrich as in the rhea (although some of this could be due to the different measurement methods used for these two birds). More interestingly, among mammals the cartilage is twice as thick in camels as in horses. In the horse, the condyles are deeply inserted into the cotyles of the preceding vertebrae; but in camels, they don’t reach even the lip of the cotyle. This should worry us, as horse and camel cervicals are grossly similar, and no osteological correlates have been identified that would allow us to determine from the bones alone how very different the cartilage is between these two mammals. So it seems possible that there were similarly dramatic differences in the neck-cartilage thickness of different sauropods. Note: I said that no osteological correlates have been identified. That doesn’t mean they don’t exist. One thing I would love to see is a serious attempt to analyse cartilage thickness across a broad range of mammals, and to examine the corresponding dry bones to see whether in fact there are correlates that could be informative in this respect. One lesson that Matt and I have learned over and over again is that there’s often plenty of data in places that are out in the open, but where no-one’s thought to look. Next time: more on searching for osteological correlates of cartilage. Then, measurements of sauropod-neck cartilage from CT scans, and likely implications for cartilage thickness in life. Evans, Mark. 1993. An investigation into the neck flexibility of two plesiosauroid plesiosaurs: Cryptoclidus eurymerus and Muraenosaurus leedsii. University College London: MSc thesis. London. Might there be some correlation with size? 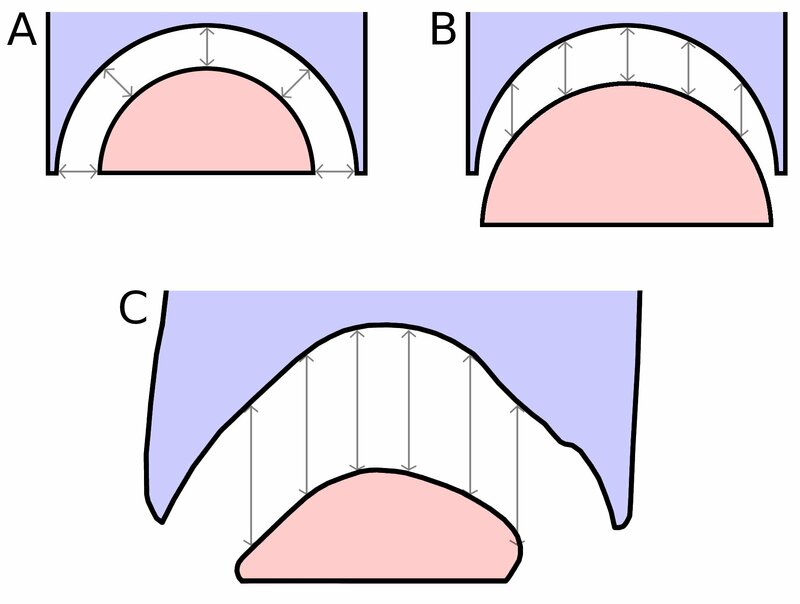 Instead of thick pads, intervertebral separations of a few centimeters between condyle and cotyle are suggested by their difference in radii of curvature (pers. obs. ), which is consistent with the tightly-fitting central articulations found by Dzemski and Christian  in Ostrich (<1 mm) and Giraffe (7–9 mm), given that articular cartilage is negatively allometric with body mass . But the key reference 78 is Malda et al. 2013, which is very explicitly about mammals only, and femoral condyles at that. Meanwhile, Bonnan et al. (2013) showed just how dramatically different the configuration of limb-bone cartilage is in sauropods compared with mammals. So none of this really tells us much about sauropods necks. Malda J, de Grauw JC, Benders KEM, Kik MJ, van der Lest CHA, et al.. (2013) Of mice, men and elephants: the relation between articular cartilage thickness and body mass. PLoS ONE. 8(2): e57683. What can be said then for cartilage between tail vertebrae then? At least in sauropods that is. At the moment: nothing at all. As far as I know, no-one has even started thinking about that issue. I smell a paper possibly in the future then. I hope so, but it won’t be by me. I have my hands full with the fun end of the animal. Thanks for these posts, Mike. It’s interesting that the camel’s (species?) cervical cartilage is quite a bit thicker than the horse’s. Prob helps explain how camels are able to bend their necks such a ridiculous amount (covered nicely here). Makes me think that cartilage thickness might correlate positively with neck flexibility. Therefore, if you had a neck whose bone structure indicated that it was inflexible, it would prob not need extra-thick cartilage between the joints. Quick question (pls forgive me if you’ve mentioned this): are there any known osteological correlates in sauropod vertebrae to indicate whether their cervical cartilage is disc-like as in most mammals, or more like a close-fitting cap as seems to be the case in most birds? Lastly, I know that here you’re really just correctly framing the question (or framing the correct question) and suitable specimens can be difficult to source, but any future survey should attempt to measure more than specimen of each selected species (and of any ontogenetic stage) to reduce the chance of any freaks being in the sample. Looking fwd to the next post. Yes, it may be that cartilage thickness correlates with neck flexibility: certainly if we put a straight line through our two “large adult mammal” data points, the slope suggests a correlation :-) Part of what’s missing at this point (apart from more data) is a mechanical idea of how thicker cartilage enables flexibility. It’s easy to see how it increases the height of neutral pose; and it’s easy to see how zyg facets broadened by cartilaginous extent increase flexibility (see a forthcoming post), but I don’t yet see how intervertebral cartilage increases flexibility. A big amen on the need for a bigger and better database! In their contribution to the PLOS collection on Sauropod Gigantism, Preuschoft and Klein explain (e.g. Figure 11) a near vertical sigmoid neck posture would conserve energy and explain weight distributions computed from sauropod track imprints. It would be interesting if the range of potential cartage thicknesses you found would allow for this posture. Are there really plesiosaur specimens with cartilage preserved? If so, wow!